The Suburban and its editor Beryl Wajsman have been recognized across Canada by the national Better Newspapers Competition for their editorial writing. Additionally, The Suburban has won eight Quebec Community Newspaper Association (QCNA) awards. Wajsman will formally receive his award May 21 when the Canadian Newspaper Association (CAN) and the Canadian Community Newspapers Association (CCNA) hold their 2009 National Convention at the Centre Sheraton in Montreal under the theme Ink & Beyond. He won second place honours in editorial writing for newspapers in the largest circulation category. Meanwhile, Wajsman is also pleased that various members of his staff will be honoured at the QCNA awards night. 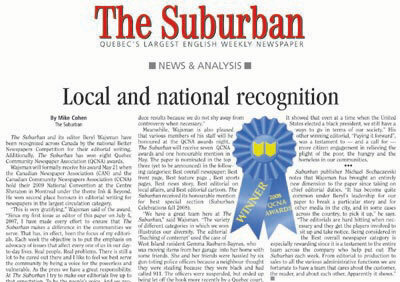 The Suburban will receive seven QCNA awards and one honourable mention in May. The paper is nominated in the top three (yet to be announced) in the following categories: Best overall newspaper; Best front page, Best feature page , Best sports pages, Best news story, Best editorial on local affairs, and Best editorial cartoon. The Suburban received its honourable mention for best special section (Suburban Celebrations fall 2008). “We have a great team here at The Suburban,” said Wajsman. “The variety of different categories in which we won illustrates our diversity. The editorial ‘Teaching of contempt’ used the case of West Island resident Gemma Raeburn-Baynes, who was moving items from her garage into her home with some friends. She and her friends were hassled by six gun-toting police officers because a neighbour thought they were stealing because they were black and had called 911. The officers were suspended, but ended up being let off the hook more recently by a Quebec court. It showed that even at a time when the United States elected a black president, we still have a ways to go in terms of our society.” His other winning editorial, “Paying it forward”, was a testament to — and a call for — more citizen engagement in relieving the plight of the poor, the hungry and the homeless in our communities.